Based on one of the most popular and beloved TV shows across the UK, the USA and European markets, Deal or No Deal: The Perfect Play is a 5-reel 3-row video slot machine produced by Blueprint Gaming that features 20 adjustable betting lines. Packed with innovative and unique rewarding options, the game brings attractive prizes such as Crazy Cash, Easy Money, Box Magic and interactive Bonus rounds where you can score up to 2.000 coins. The Deal or No Deal: The Perfect Play slot review comes with proven winning tips, so read now and learn how to win. Unfortunatly, we have no free play mode for Deal or No Deal: The Perfect Play available. Check out the screenshots below and hop right into action with one of the recommended casino sites! Just like all other titles from the same provider, this is a game you can play for fun or for the real money. 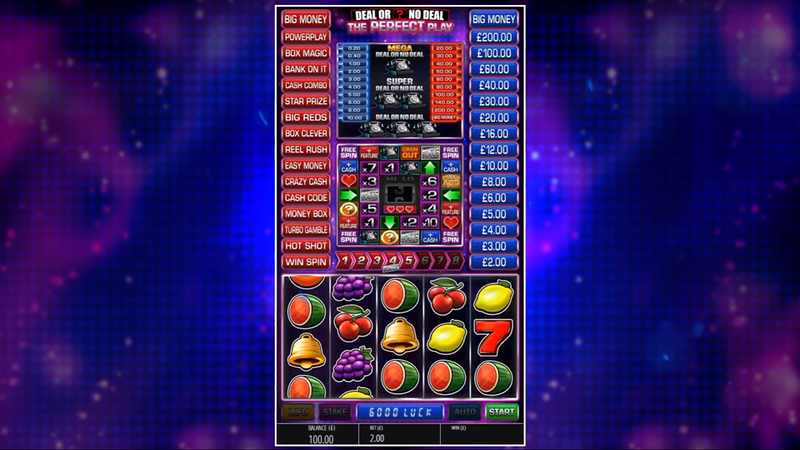 The game’s mechanics is rather unique as it comes with the base setting of 5 reels and 3 rows that looks like a standard fruity machine and the bonus set that awards various prizes and mini-games. The first one requires the winners to collect 3+ Melons, Cherries, Grapes, Oranges or Lemons in order to receive the prize according to the paytable. On the other side, the Deal or No Deal: The Perfect Play bonus setting called Super Board is to be activated with 3 or more game’s logos appearing anywhere on the reels. This is where you can earn Deal or No Deal: The Perfect Play free spins, multipliers applied to the line bet, extra cash and more. Thanks to the coin denomination between €0.01 and €1, players can set up their betting strategy and wager between €0.10 and €20 per round. If your bankroll allows, use the Autoplay mode to spin the reels for a predefined number of times without being interrupted. The Super Board also has the special mini-games that will make you feel like playing the real TV show. All popular options are present, including phone help and you can use them and try to beat the banker. First, prospective winners are introduced to the 20-box setting and asked to pick their lucky box. For a quick pick, press the phone icon and when 4 boxes appear fully-armed with prizes, the winners will be taken to the screen with golden envelopes. If the Lady Luck is on your side, you’ll see the Perfect Play jackpot of 2.000 coins boosting your bankroll. You can play online on supported Blueprint Gaming sites using a mobile browser only because there is no need to download the iPhone app or the Android .apk file. 3. What is the RTP factor of Deal or No Deal: The Perfect Play? The RTP official info is still a subject of our research and will be added to the Deal or No Deal: The Perfect Play tutorial. This is an attractive crossover of different genres resulted in an action-packed slot machine with arcade elements and interactive rounds. We can surely recommend it to both novice and experienced casino players. If you’re still unsure or just want to learn the rules, try the Deal or No Deal: The Perfect Play free play demo and come back again to improve the rating of your bankroll.